Things to read/look at while sitting/standing/waiting/stuck on transit: The above photos are a fraction of the thousands of photos collected by Kipp Teague at his Project Apollo page on Flickr. Pretty great stuff to thumb through, especially if you saw “The Martian” over the weekend. All photos courtesy of NASA. HWR quickie movie review: “The Martian” is great and well worth seeing on the big screen. While I’m not personally persuaded (yet) that we need to send humans to Mars, I really like the movie as both a celebration of human ingenuity and diversity. The movie was based on the book, “The Martian,” which is available in paperback and gets into a lot of the science behind the decisions made — but does so in a very entertaining fashion. Also this: Popular Mechanics considers whether it’s possible to grow potatoes on Mars. Things to read/look at while sitting/standing/waiting/stuck on transit 2: If you liked “The Martian,” you may like another book about exploration, “In the Kingdom of Ice,” by Hampton Sides. This one is set in the late 1800s and follows a doomed American expedition to the North Pole — at a time when some experts thought only America had the gumption and know-how to reach the Pole. I’m about halfway through and it’s a page turner. Also available in paperback or on tablets. Article here on the lingering dispute over who first reached the North Pole. 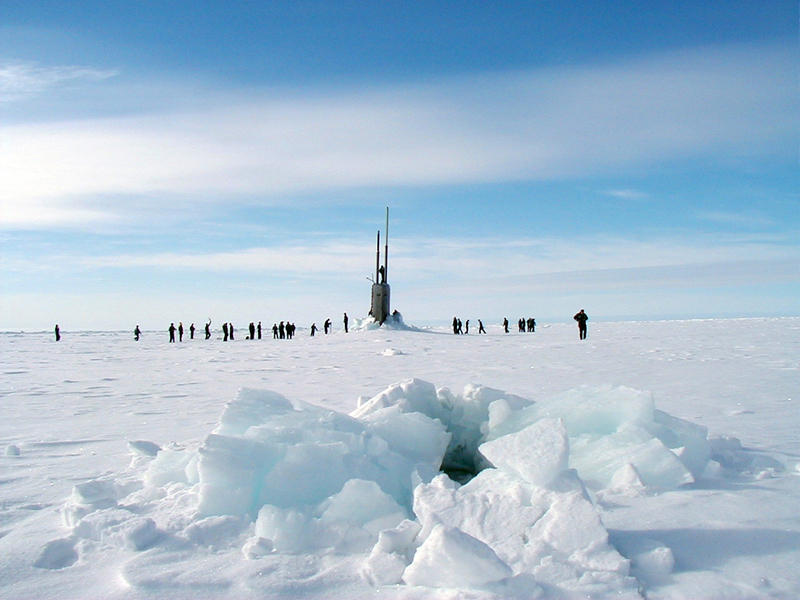 Sailors stationed aboard the Los Angeles-class fast attack submarine USS Scranton explore the Arctic ice surface in 2001. Photo: U.S. Navy. Things to read on transit 3: if you’re interested in exploration closer to home, I also heartily recommend Stephen Ambrose’s Undaunted Courage about the Lewis & Clark expedition and Tony Horwitz’s Blue Latitudes about working on a replica of Capt. Cook’s ship. Both will keep you fine company while on the bus, train or wherever. Bill Bryson’s “Walk in the Woods” about hiking parts of the Appalachian Trail is also hilarious and informative. 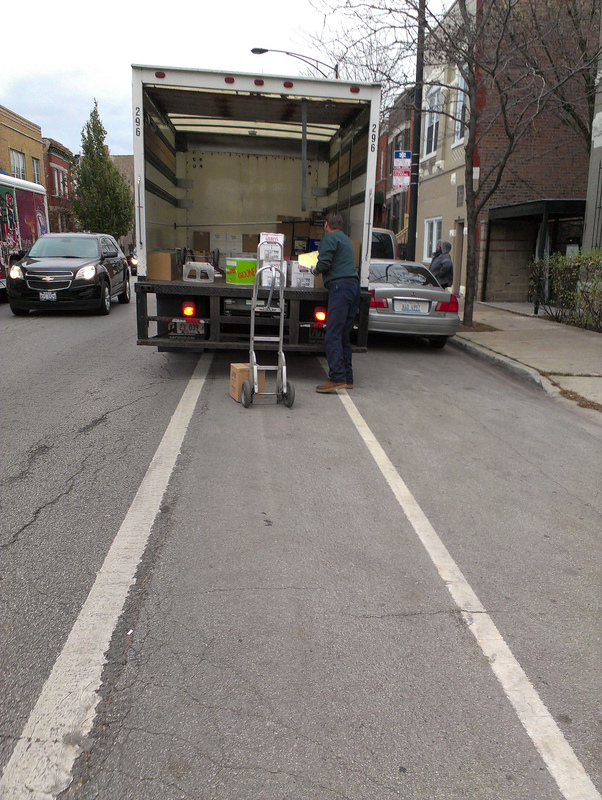 Delivery truck vs bike lane in Chi-town. Photo by get directly down, via Flickr creative commons. Probably not, but there’s a new federal program — with a whopping $200,000 in funding — to help cities encourage more trucks to deliver goods at nights instead of blocking streets during the day. Of course, there’s a challenge that comes with that: night-time truck noise in neighborhoods with a mix of residential and commercial. LAX officials announced the agreement late last week. Fares will begin at $7 and could rise after six months. Good news for those who don’t like driving themselves to the airport via the 405 or other congested South Bay streets. The concern is that new parking rules in Chicago — rules that allow new developments near transit without parking — could encourage more tear-downs of historic or near-historic buildings. Long story short: another story about gentrification not going down easy. Not sure about the ‘surprising’ part, but the recent plunge in gas prices — California included — could encourage people to drive more and will likely hurt economies in countries that depend heavily on the energy sector. 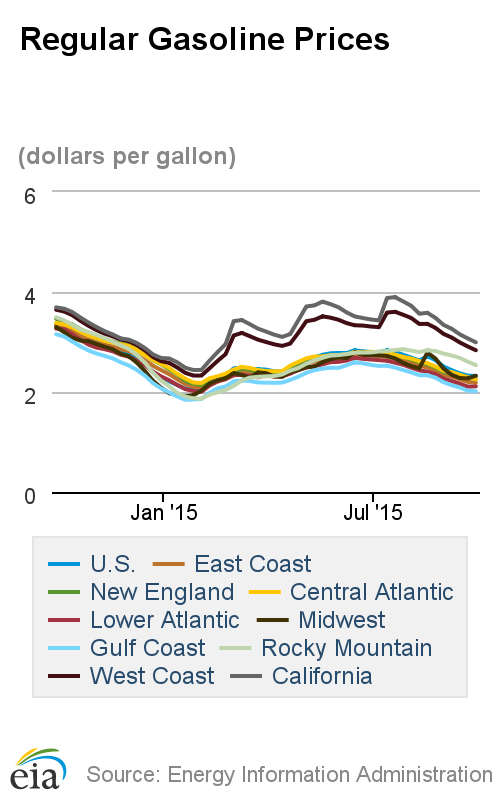 Here’s a Wall Street Journal article from earlier this year about the impact of gas prices on transit ridership. Some say it’s a big impact, others say not so much. Attentive readers know that Metro’s ridership has dipped since April ’14, a time span that includes gas prices well over $4 a gallon. Other factors likely at play: fare evasion crackdown, fare increase, more gate locking, an improve local economy, delays due to maintenance or service disruptions. A critical look at recycling that suggests that many recycling efforts fail to have a beneficial impact on the environment and cost a lot more than simply burying trash. Read the article for a full explanation. I include it here because it’s a skeptical piece about an important topic that many local governments and elected officials have pursued. Nothing wrong with kicking the tires of something, especially something that many hold up as a righteous cause. 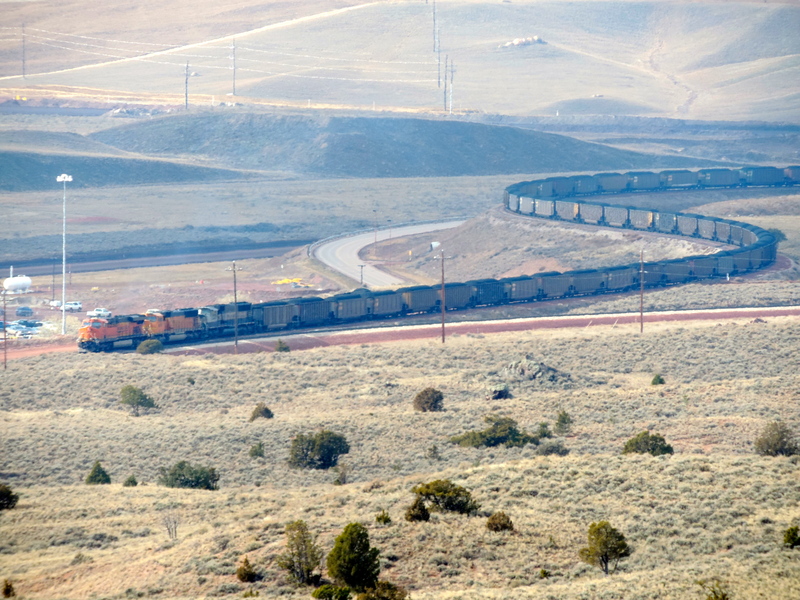 A coal train in southern Montana. Photo by WildEarth Guardians, via Flickr creative commons. Quasi-related: a friend of this column dropped me a note reminding me to be cautious of the way I discuss electric buses (Metro has purchased five of them, which are in the testing phase). Her issue is one that I have noted before: electric buses (and trains, too) rely on electricity that may have been generated using coal, meaning that the buses aren’t exactly zero emissions — it’s just that the emissions are burped into the atmosphere in another location. That point is duly noted. I appreciate the skepticism. That said, we’ve also noted this: the cleaner that electricity becomes, the cleaner that the buses become. California has become increasingly less reliant on coal in recent times and the Los Angeles Department of Water and Power has said it is phasing out purchasing electricity generated by burning coal at the infamous Intermountain and Navajo stations in Utah and Arizona, respectively, in coming years. 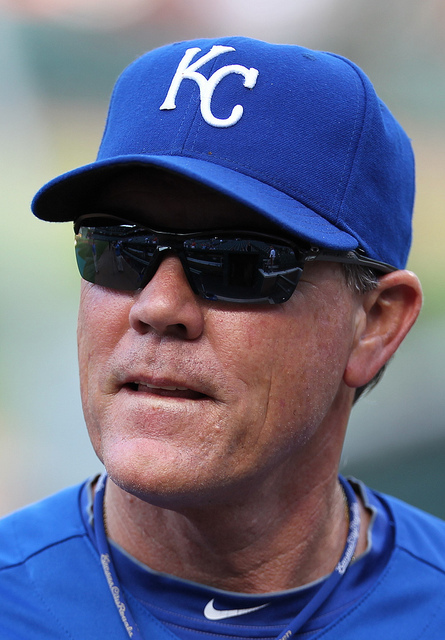 Ned Yost: says he knew the Royals would beat the A’s in the wildcard last year. Hmm. Photo by Keith Allison, via Flickr creative commons. Things to read on transit 3: How Ned Yost made the Kansas City Royals unstoppable in the NYT Magazine. The oft-criticized manager explains why he doesn’t overly rely on analytics and his rationale for decisions that others think are dunderheaded, at best. A Dodgers-Royals World Series would certainly be fun, even if we’re getting way ahead of ourselves. Related: the Dodger Stadium Express is running in the post-season with service to Games 1 and 2 against the Mets this Friday and Saturday. We’re still waiting for Major League Baseball to set game times with all four division series set to play that day. The Cubs and Pirates certainly aren’t looking ahead, with Chicago’s Jake Arrieta starting against the Pirates’ Gerrit Cole in Wednesday’s wildcard game. Quasi-related: a discussion on the L.A. Reddit page about the appropriateness of Metro’s Twitter feud with the New York MTA. It’s reddit, so there’s some AOL, adult-oriented language. Oct. 1: all about cities — gentrification, TODs vs parking, the changing DTLA skyline, Show Me a Hero, cities and transit and diversity. Sept. 30: Can Uber and Lyft solve our first-mile-last-mile problems?, trains and cleanliness, the blessing of the infrastructure. Sept. 28: Lunar eclipse over Metro, the San Fernando Valley wish list of transit projects, things to read on transit (profile of Grimes in the New Yorker) and an update on the five electric buses delivered to Metro earlier this year. Sept. 22: New York subway’s ‘pizza rat,’ more on China’s bid to build high-speed rail to Vegas, a motion that seeks to make college/vocational TAP cards easier and cheaper to obtain and books versus tablets on transit. I’m also on Twitter, Instagram and have a photo blog where I share my non-transportationy stuff. Don’t want to comment but want to reach me? Email me! The best way to brush these people off is to not given them attention. Face it, this is the same old argument that we often hear all the time and it’s nothing new. If these people have to complain that even electricity is bad, they can go back to living a cave-man style life out in the wilderness. They can’t have it both ways: a way of modern luxury and technology, likely to be consumers of electricity as well provided that they use smartphones that need recharging or using computers to connect to the internet, so the hypocrisy is that they too use electricity which could be provided by coal, while complaining about where it comes from. Common themes of these eco-liberals: complain about everything, offer no real practical solutions, expects everyone else to agree to their ideas despite “tolerance” and “open-minded” about other people’s views, and doesn’t realize the hypocrisy of their statements. Another thing these neo-liberal “complainers” somehow deflect is how destructive refining crude oil into usable gasoline is to the environment…. akin to burning coal or natural gas for electricity generation. So, by comparison, if I only pollute the environment when generating the energy (not using the energy) then I would say that is definitely a better case senario than the ‘dual-pronged’ attack on our clean air environment that the status quo gets you. You can’t go from dirty coal to zero emission clean energy in one step, unless you start over in a utopian space colony on Mars relying only on direct solar energy. All other cases, you have to move incrementally. Electric vehicles offer us the best solution for such a future, in light of this reality. Anyone who second-guesses should be seen as obstructionist. Of course, California still remains the highest price gas state in the nation thanks to our special blend laws. Am I supposed to feel sorry for a cartel of OPEC countries? I have one great big plus on low gas prices: it’ll be a damaging blow to ISIS terrorists that make their money by smuggling oil. Which somehow other cities all around the world that operate with fare enforcement and locked gates and improved local economy somehow manage to work their system fine. Delays due to maintenance and service disruptions OTOH, is no fault but the operators lack of competence. The flip side is that people don’t want old, blighted homes taking up valuable land space while making the neighborhood look bad either. How do you pick and choose which homes are “historical” while others being just a piece of junk? Many single story homes in LA were built in the 1910s-1920s era, made to unsafe earthquake standards, lead paint, and full of asbestos. 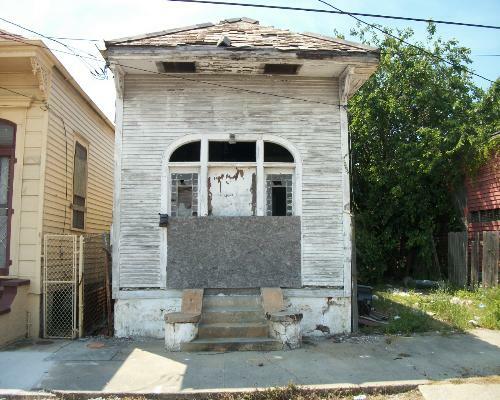 They may have some history behind them and can be considered “historical” to some as well, but the homes are worthless, it’s a blight and it’s squatting on land that’s more valuable and has a lot more opportunities. 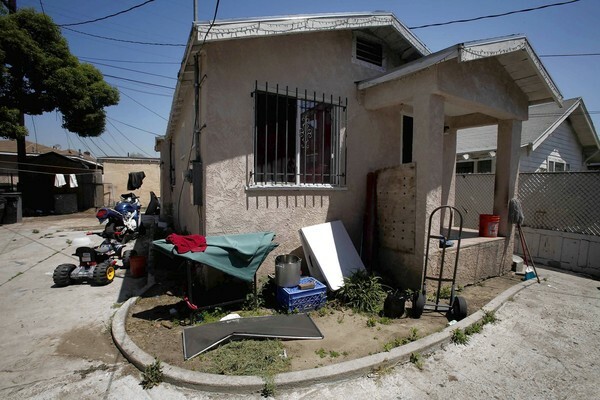 The more we keep these worthless, blighted homes that do nothing but sit on valuable land taking up the real estate market, the more people are going to be priced out of the market, the more people will be forced out onto the streets because they cannot afford rent or purchase a home. Unfortunately, it’s a tough choice to make. You have to destroy old buildings and homes and make way for newer higher density ones. Cities change and change means it needs to make tough decisions. Sentimental emotions cannot triumph over logical, rational decisions and in that case, they will have to be torn down and replaced. LAWA expects 50,000 Flyaway passengers per year from Long Beach; that’s 137 per day, or less than 2 bus loads on average in each direction. What service frequency can these numbers support? I’m guessing every 2 hours at best. This from a location that’s right on the Blue Line. Yes, a 1-seat ride to the terminal is great, but with such low frequency I’d mostly opt for the much more frequent 2-transfer ride (Blue Line to Green Line to G shuttle). 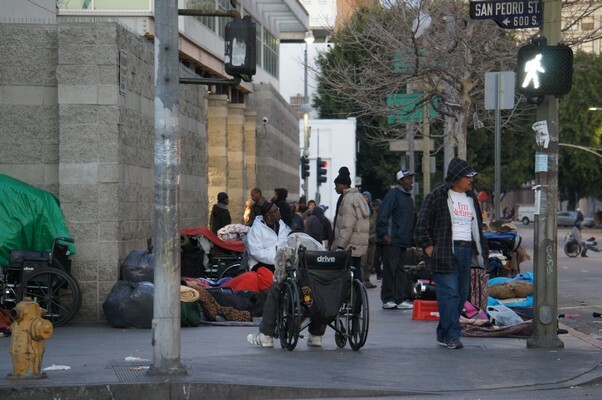 Many people in LA are already used to coping with helicopters, emergency vehicle sirens, early morning garbage trucks, late night party goers, homeless people combing through people’s garbage, planes flying overhead, cars whizzing by, and big truck making deliveries to 7-Eleven and other late night urban landscape noises while they are sleeping. You live in LA, you learn to cope and deal with these things. This is LA after all, a city that never sleeps. If you can’t handle this, you’re can’t handle living in LA. If it’s too much of a hassle to approve comments, then why not just remove moderation all together? Most other social commentary websites (i.e. Reddit, 4chan, Facebook, Twitter, vb BBS sites, etc.) do not have moderation and people can freely express anything and back them up with links, photos, videos. Besides, many Millennials who graduated college are already used to the idea that when one person makes a comment, it needs to be backed up with an article or proof rather than just taking their word for it. It’s how we wrote our essays, our papers, etc. etc. You can’t say “limit your links, photos, and videos” while also at the same time asking people to cite proof to backup their claims. It’s like saying “I saw Bigfoot” but having absolutely nothing to back it up. If you can’t back it up, then the comments are worthless. I understand the concern that some people may have a problem with this because it may open doors to profanity or hateful comments like “I don’t like [whatever]” but we live in an internet age. Many people are used to it by now that they really don’t care, they take it as an opinion, if they don’t agree with it, they brush it off and go on with their lives. We’re going to keep moderating, period. Sorry Steve, but as much as I want to say I’m pro Metro and would like to say I agree with what they do, you can’t say that since Metro is a government agency. The “we” identifier in this case is exclusive and refers to you and the will of Metro (government agency) and “period” can be inferred that you have the power to do so indefinitely. Unfortunately Steve, government does not have such powers, its powers are limited and in the United States, it’s the people who hold the real powers here that keeps the government in check. Therefore, make no mistake that the use of the word “we” that you used is not the inclusive as it may not reflect all the views of the people in LA County who pay taxes into keeping Metro and The Source running; those are the people that are the bosses of Metro as they’re the ones that pay everyone’s salary, pensions, and benefit at Metro. Whether or not The Source should or should not be moderated is the will of the voters and taxpayers and it is not your call nor is anything “period” as an indefinite. The Source is not yours, it is run by taxpayers, so you need to remind yourself that you being the moderator and being paid to do so solely because the people are allowing you to be the moderator. However, if by any chance the people feel that you are not doing your job as an impartial moderator, incapable of moderating it due to whatever reason, or do not feel that you are exercising restraint under the auspices of “reasonable restraint” under the free speech clause of the First Amendment, the people could at any time, write to their representatives on the Metro Board to make The Source moderation free or if the politicians are incapable of such, they can elect politicians that will do so. Whether you personally agree or not that people have the right to say anything they want has nothing to do with this. If enough taxpayers and voters of LA County say that The Source should go moderator free, you’re going to have to give up your moderator powers. Make no mistake that it is highly improbable at this moment (but not 100% impossible either), but that doesn’t mean you can use the exclusive “we” and “period” as something that cannot be changed under a democracy. Steve dislikes my comments so bad that he deletes them so no one else can read or reply to them. As a former RTD/MTA employee my insight as to the true working of the agency make him and other cringe. If you believe this is the case that The Source might be purging your comments because of your status as a former employee of Metro, have you considered writing your concerns about this to your representative elected official serving on the Metro Board? Every resident in LA County, regardless whether they are former employees of Metro or not, has at least one person on the Metro Board that is their representative voice there, which is one of the five LA County Board of Supervisors. So apparently the Ministry of Truth thinks those things make any difference; as witnessed daily be the number of people using the 100% “secure” and “hardened” Subway (Red/Purple) stations as homeless shelters.